Some cats are innies and some are outties. Some have the best of both worlds. But for those that are housed exclusively indoors, boredom can set in if the environment lacks enrichment. There is plenty to suggest that indoor-only cats live longer, safer lives than their outdoor counterparts. But this is only true if their lives are kept fun and engaging. If you are going to have your cat inside, it is important to make its environment as stimulating as possible. If you don’t, cats can quickly become bored, stressed and even depressed, resulting in detrimental and destructive behaviours. So, how do you prevent boredom in your indoor cat? Luckily, the cat species is easily pleased so you needn’t worry about spending a fortune on new toys and gadgets. Simple household items can provide ample entertainment for kittens and cats and basic things like string, ribbon, bells, bottles and balls can be picked up easily and cheaply. Think about your house from your cat's point of view. Ask yourself, is it cat friendly? Is there plenty for my cat to do? Are there places for my cat to sit and look outside? Are there enough playthings dotted around? Is it safe, varied and comfortable? In which case, you need to try and resolve the issue before the behaviour develops out of control. For example, boredom can lead to over-grooming, which in turn leads to skin complaints and hairball formation. Boredom can also lead to over-eating or lack of appetite, resulting in unhealthy weight change. 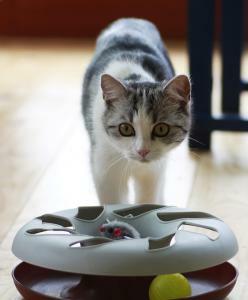 Try to rotate toys; if your cat has a particular favourite, take it away for a few days and replace it with another. When your cat appears to be tiring of the new toy, return it’s favourite and see how excited your cat becomes! This just proves that you don’t need to splash out on new toys every time the novelty of the old ones wears off. That said, you can always make your own with everyday items in your home. Having an indoor cat means it won’t always have your company in the house and will be left to its own devices on some occasions. Providing enough for your cat to do and play with in your absence is just as important as interacting with your cat when you’re there. Scent searching is a great game for cats that are regularly left alone. Not only will it give your cat something to do to occupy the long hours, but it is a comfort to have a familiar scent to follow. Simply spray a sock with your favourite perfume or scent and hide it for your cat to find. Choose a different item and scent each day to keep things interesting. Cats go crazy for catnip, so invest in some catnip-filled toys. These will help calm your cat during periods of stress and will provide a great plaything and comforter. Aside from fresh drinking water, items like scratching posts, climbers and beds are a given and every cat should have access to them. Cats have an instinctual urge to scratch and they do it for various reasons of benefit. Therefore, scratching should always be facilitated one way or another and it’s better that your cat scratches a sisal post than your expensive sofa or furniture leg. Cats are no different from the rest of us and thoroughly enjoy a good view. Whatever the size of your house, all will have the one thing cats desire most - a window. While he might not be venturing into the great outdoors, your cat certainly needs to see it! There is nothing worse than feeling cooped up and your cat shouldn't have to suffer for staying safe inside. If you can, position a bird feeder directly outside the window to keep your cat entertained during the day. The comings and goings of wildlife are a great distraction and the warm, sunny windowsill is the ideal place for that afternoon snooze. If your cat is older or athritic, give it a helping hand up to the window with a strategically placed chair or ramp. Great article. I share my time with my cats between a flat and a farmhouse so they could get particularly frustrated with the flat. One of the things that helps is allowing them to climb. I have both a tall cat tree which has a small footprint so as not to overwhelm the flat and I keep my tall step ladder closed but leaning up against a wall rather than put away in a cupboard. They love to sit on the top step and watch.